Williams is a senior archaeologist, team leader and part owner at Extent Heritage Pty Ltd, one of the largest private consulting firms specialising in Aboriginal and historical heritage in Australia, from 2008 to the present. During this time, Williams has become one of the leading archaeological consultants in the Sydney basin, and has undertaken work in every Australian State and Territory. He has mentored a team of ~20 archaeologists, managed annual budgets of ~$1.5 million, and has produced over 200 reports on archaeological sites (and associated developments) across all parts of Australia. Williams’ PhD research included a number of important and well-cited research outputs in the field of sum probability analysis (i.e. radiocarbon data as a proxy for past human activity), including the development of a comprehensive dataset of archaeological radiocarbon data (totalling 5,044 dates from 1,748 sites), appropriate protocols for the use of time-series techniques, and a wide range of applications to explore human-environment-climate interactions, all of which are now routinely used by the archaeological and scientific community. 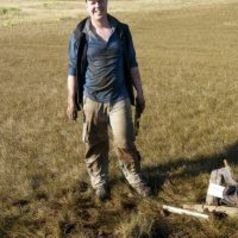 His work significantly advances the exploitation of radiocarbon dates as a mainstream and reliable proxy for exploring hunter-gatherer behaviour in Australia; and provides a number of future directions for both time-series analysis and Australian research more generally. Globally, the analyses undertaken remain at the forefront of the technique, and are routinely used, applied and critiqued across the world.